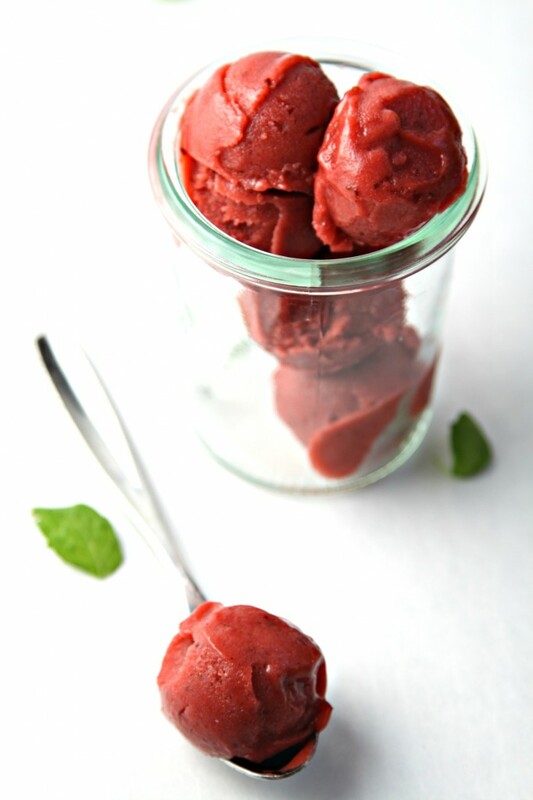 One bite of this balsamic roasted strawberry and rhubarb sorbet and I think you’ll agree that your spring and summer just got a whole lot zesty and zippier. If you’ve never tried roasted strawberries I’m going to have to insist that you do (in the non pushiest way possible of course). If you have then you know how absolutely intoxicating the berries are when they’ve been hit with that low and slow heat. I find that to be true of most things that go through the roasting process. In short, roasting rocks and you should and simply must try it. I’m kind of obsessed with making sorbets. Clearly as we’ve shared: WATERMELON SORBET, BOOZY BLUEBERRY THYME SORBET, CANTALOUPE SORBET, GRAPE SORBET, POMEGRANATE SORBET, YELLOW WATERMELON AND LIME SORBET, and now this balsamic roasted strawberry and rhubarb number that will have your head spinning (in the best possible way). I have to admit, this one is by far my favorite to date. It’s big, bold and boisterous starting with it’s intense and intoxicating color it ‘shard to look away. Practically taunting you to taste it. Once you do, well let’s just say I’ll be making this A LOT this spring and I think you will be too. Best part, sorbets are seriously simple to make. Roasting does involve a few additional steps but it’s completely worth it. You could even roast the night before, throw everything in the fridge to chill and then get your sorbet on in the a.m. You can be plopping your spoon in mid afternoon. Ready to make some? Of course you are. Get our BALSAMIC ROASTED STRAWBERRY RHUBARB SORBBET recipe over on DIXIE CRYSTALS blog. You are obsessed, you’ve created quite a collection and I love the sound of all of them!! But I agree roasting totally brings out a flavor that just can’t be acquired with fruit any other way and I love the use of balsamic here! We are so into roasting lately, so I saw this and absolutely love it. So perfect for summer! This is like a work of art Paula – art I wanna EAT!! I could eat all of this in one sitting, looks soooo good!!!!! I absolutely agree, roasting rocks! And this sorbet also rocks! Looks amazing! I need no further convincing! Must. Have. Now. Love your collection. I’m a recent and dedicated convert to fruit and balsamic reduction. 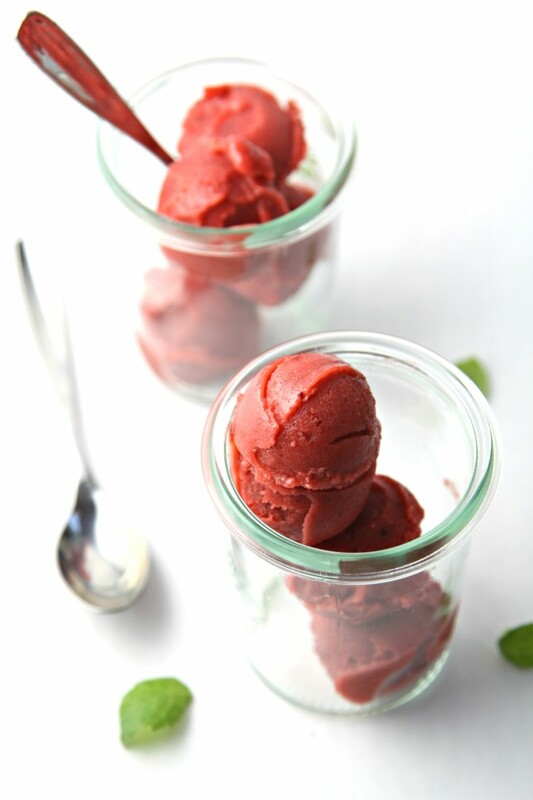 Sounds delish in this sorbet! Could I bribe you to send me a quart ASAP? This looks amazing! Roasted strawberries = bliss. Could you pass me a bowl of this and a really big spoon, please? Hi Linda, I’ve not tried it without the ice cream maker. I have heard that you can simply transfer it to the freezer – but again I haven’t tried that method. Please let us know how it turns out if you do try it. Thanks! You are a culinary genius! Am also envious of your photos- how in the world do you get this not melt while you snap away? Thanks Jessica. I usually put the jars and cookie scooper into the freezer for a few minutes prior to shooting to help keep things cold. Paula, your photos are gorgeous!!! I’d love some sorbet! Seriously gorgeous. I’m embarrassed to admit I’ve not roasted strawberries yet, but that is definitely going to change soon. This is just simply summer in a glass. Love it! I recently made balsamic roasted strawberry ice cream! On the same wavelength as you evidently. I need to post it soon. Love the idea of adding rhubarb and making it a sorbet. I have a serious rhubarb addiction and you just fed it. Yum! I cannot wait to try this. Love all the flavor you put into this one lots of sweet and tart and tangy. This is the most beautiful shade of red in a sorbet that I have ever seen! well done! GAH!! So gorg! I’ll take two bowls of this, pa-lease?!! Now this is a summer treat! Perfect for an adults dinner party. Can’t wait to indulge in it! Yum! Love the flavors going on here. Such great bold flavors here, and keep those delicious sorbets coming, I love them all! You’ve convinced me. I’ll take a couple of scoops. Strawberries, rhubarb, and balsamic are made for each other. I agree that roasting the fruit brings out the best flavor. This looks incredibly refreshing! And beautiful! Pure genius. Hello summer! 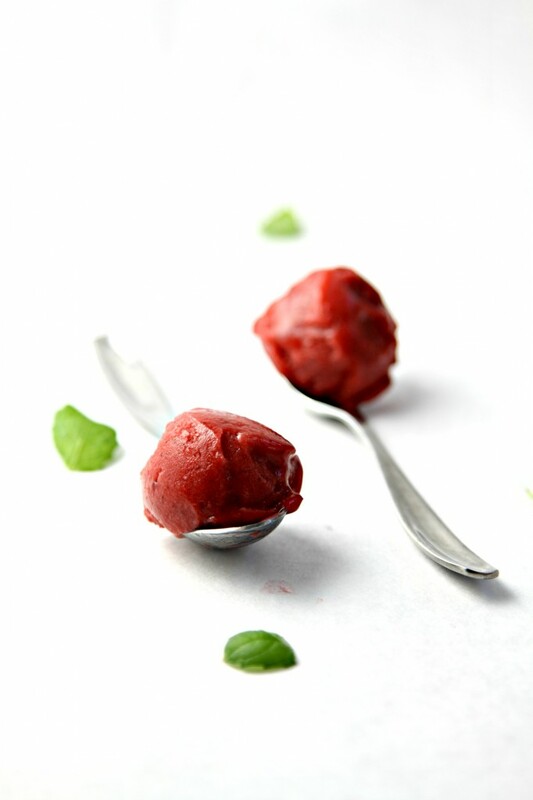 This sorbet is perfect for late night snacking. Just reading the title made me drool. I dunno… Perhaps it’s some Pavlovian response to words strawberry, rhubarb, balsamic, and sorbet in one title. Holy yum! OMG so yum! The color and flavors in this sorbet are amazing. I’ve been craving anything rhubarb! Pinned! Oh, Paula. I want a bite right now. Cannot wait for some fresh berries to roast and whip into this amazing sorbet! Love roasting fruit – it really brings out the flavors! This sounds outstanding! This one goes to my rhubarb recipe collection. Great recipe. Gooooooorgeous color! Love the flavor combo, too! Dear sweet mother of it all this is better than cheesecake! What a gorgeous color. The flavor probably just pops in your mouth. Plus smooth and cool. Sounds like the best of the best to me. Oh my word, this is almost too gorgeous to eat! I love sorbets in summer, dairy just seems too heavy. This looks completely perfect. Shut the front door! This sorbet sounds amazing! Love the flavors and how light and summery it is! Perfect! We made this and it was fabulous. Loved the cracked pepper. Used our family’s 100 yr. old rhubarb plant transplanted from upstate NY and back to Denver, CO circa WW1!! This was special! I always love your creativity. The other day I was trying to think of something to do with Balsamic, other than drizzle over mozzarella and tomato! Great idea!